I love the first one. At first, when I glanced at it, I thought it was grafitti maybe on a brick building somewhere; that would be cool. u just keep up that work on levithan scott-la. im kinda enjoying the abscence of book insanity and just some totally randomness. speaking of levithan, i got a book by him [David Levithan] the other day @ the library. its call “are we there yet” i havent started reading it (im currently reading a book by john green). i was at the library and i saw it (“are we there yet” not the book by john green) and i was like “hmmm…levithan…where have i heard that before…. OH YA! !” and i remembered that u named ur new book after him so i figured he must’ve been a good writer if you were gonna name ur book after him. any ways keep up the good work, i know its gonna be awesome. I like the Uglies picture! And the one of Moz is cool, too. But they’re both fawesome! Hm… I wish I was good at drawing and painting and stuff. 2nd off: WOAH!!!!!!! Dat is fawesome pictures! I love manga/anime. Wish I could draw like that. *wistful sigh* But alas, I can not. I yuv it sooooooomuch!!! humph. i want news now. humph. i also want more Hiro chapters. *sigh*. Excellent art. Wonderful books to inspire. Scott, I’m captured by your books!!! Keep writing. That is some awesome fanart. Can’t wait to hear about Leviathan!!!! uh…..wow……just wow……These pictures are very……..um…….Interesting? Okay, okay I find them quiet disturbing but that’s me…….oh well…….they’re still good…. Also, I really like these covers. I haven’t read Last Days yet, so I don’t know much about the character drawn there, but I really like the cover for Uglies. The painting mixed with the graffiti art in the back works well. Wow, I’m impressed! I wonder if they’ll do anything else? why do you never post any of my fanart, scott-la? i did an uber-awesome portrait of all the midnighters at lunch, and i totally sent it to you. you should check fanmail more. i drew this great tithe fanart picture yesterday. had much purple plaid. love both of those pieces…love the spiky letters and awesome hair on the first one, and the uber-fawesome color scheme on the second. moz rox. crap, my school is being all stupid and moronic and blocking EVERYTHING. like, google and LJ and the HQ and the blocker sites. it’s way stupid. Yay, school’s almost out for the holidays! I feel sorry for the people that have school this week. losers. I haven’t forgotten about Star Wars quotes. Just haven’t gotten any yet. So I’m going from memory. i have school all week. ugh!! what?! u dont hav school allie-wa! tomorow is my last day but still, i had to survive all FOUR days! o well. tommorrow we r walking down to this giant theater to see the movie elf (in school) YAY! wow, we watched elf in french class today. in english. with the latin teacher subbing in for the absente french teafcher. my school still had google images, but it blocked wikipedia. stupid. That is really cool fan art. I love the uglies book cover. 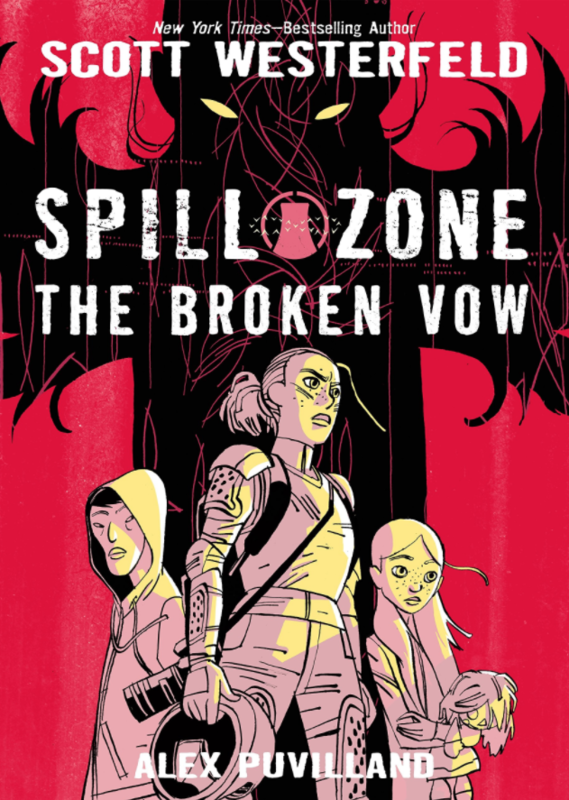 Id buy the book…………….just for the cover. Okay maybe for the book tooo! 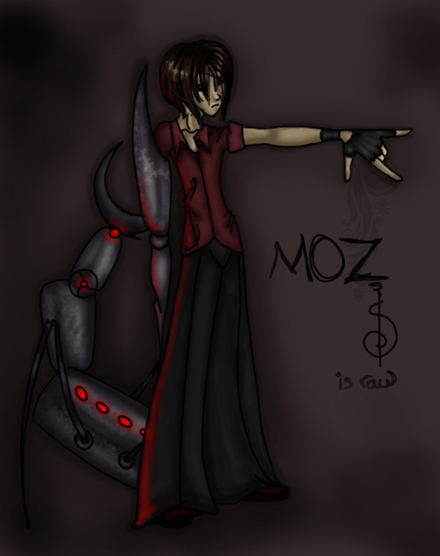 I never really imagined Moz like that but its cool. Love it! I am finall dome with midterms! We watched the drinch stoll Christmas in class. Funny stuff. those are really good, the uglies one is fawesome! ok sorry for everyone that is reading this comment, cuz its just me venting, bad day….very bad day. 🙁 I had this test in my science class and it was a fairly big test that counted for a lot of my grade, and i think i failed it. 🙁 ok well maybe not failed but came darn close…i got really confused on some parts that the teacher never even talked about or told us to study so i was like lost….and today was the last day of school until 2008…which is happy, except that means that awful science test will be haunting me until i come back in Janurary to find out what i got. i also forgot to turn in my yearbook money so i may not get a yearbook and to top it all off i didn’t get my moms container back from my english teacher(we got to eat food and watch a movie in my english class today…it was the only good part of my day) so my mom is going to be mad at me. then, in p.e. we had to go skating *bleh* i hate skating. i got painful blisters, it was retarted and it made us late for lunch. well i don’t remember what else happend but it was just not a good day. 🙁 sorry for the venting.. and the negativeness…. usually im not like this. And tomarrow I have a Bio. Test !! Ugg…..
LAST test, I got this one question wrong. They said to lable the parts of the plant cell and I REALLY thought it was pointing to the little stuff inside the Nucleus (Cromatin ) But NO… it was just the nucleus. Well KILL ME FOR BEING MORE SPECIFIC ! I really need an A on this test, so I should be studing…….. now…..
Santa Clause is bringing it! lol. i hate bio! i have a test on friday. They are both good. The first one though, i figured Shay was a blonde. Tally definatly would have had dark hair to me. But i guess tis my opinion. Anyone else see her dark haired? the clothes are sort of odd. i imagined tally’s hair as pretty light though—like ono the real cover. have i mentioned that i HATE all you people with long vacations? i’ve only got the week of christmas off, and then come back january 2nd. today was our last day so from now until January 3rd we have off. and then like a week after that we get a few more days off b/c it’ll be the end of the semester. WOOOOOOOOO! i just got out of scool today! no scool til january 3! our scool has been blocking all the blogs and chat sites and….everything since like…forever. it stinks. I like the one of Moz. I need to read that book again…. 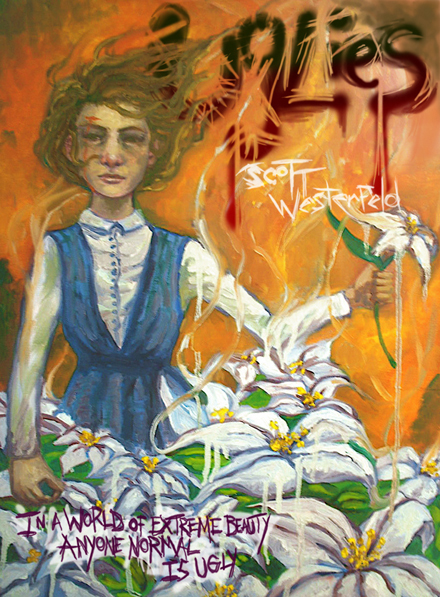 You send it to scottwesterfeld @ scottwesterfeld.com, minus the spaces. i love fanart. i love looking at fanart. i love drawing fanart. you should post more fanart, scott-la. you should post some of my fanart. it’s prettymoful. why does everyone get longer breaks than me?????! and after the break, there’s no time off til like, forever. just sad little Martin Luther King Jr Day, all off on it’s lonesome in january. poor Serafina-la. we shood all pray for you. i probably get more summer or something though. completely amazing!!! i totally can’t draw or paint, so anyone who can automatically earns my respect! fanart rocks. when it’s done good. i can’t draw, though. I can draw good things sometimes. rarely. omg. omg. I get my SAT scores tomorrow. You can’t imagine how nervous-making it is to know that your future will be known tomorrow! ok, so I”m being a little overdramatic. But just a little. They will be on collegeboard’s website in my account. I think. If I have an account. If I don’t I have to wait til they go out in the mail…then I won’t get them til January!!!! hey Allie-wa…arent you in seventh grade? hhhmmm…i guess you can take sats in as a sevy. but i dont wanna. Yeah, I’m in 7th grade. But they let you take the SAT in 7th grade. but not 8th. then you take the PSAT. which makes no sense…why take the SAT before the PSAT(practice sat)? I think you can go the collegeboard.com and get information about it. but idk. I think your district has to provide the stuff. And you have to pay and…wow. It’s really stupid to take the sat in 7th grade. This year doesn’t really count but still…I want to see how I did! only 4 hours and 32 minutes until tomorrow! omg. omg. omg. Funny thing is I have 2 older brothers and neither of them have taken the SAT. lol. I can’t wait to see how I did…as you can imagine. Oh boy! $ hours and 30 minutes!